Neil Tomkins became Cardiff champion for the fourth time with a tense 4-3 win over Newport champion and team-mate Alun Squire in the final. 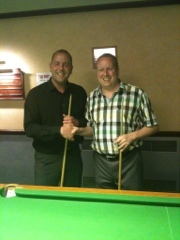 There was a decent turnout for the match at Tredegar Cons including double world champion Mark Williams. The first frame was the closest of the night. Alun took a 49 lead through a 40 break. Neil mopped up the remaining balls up to the black however with a 24 and 20 break, and sunk the black after Alun’s safety just ran on towards the middle pocket. The players exchanged 30 breaks in the next two frames, Neil winning the second frame and Alun getting into the match with the third. In the fourth frame Neil ensured he went into the interval with a 3-1 lead by clearing from the last red to pink. It’s fair to say that Alun came out fighting after the break. In the fifth frame he knocked in a superb 73 break, and then bettered that break in the sixth frame with an 84 to level the match at 3-3. He looked to be on for a ton but just left himself a tricky last red. The decider was arguably the tensest frame of the match. Both players missed good chances but Neil just kept the scoreboard ticking over enough to take a healthy lead and a fluked red late in the frame helped him towards a winning margin. It’s a cliche but neither player deserved to lose.